Join us on January 29th, 2018 for our monthly member’s meeting. 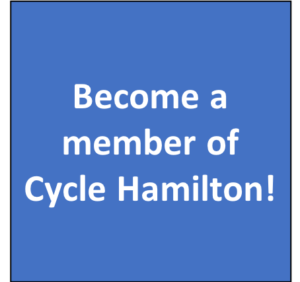 Each month Cycle Hamilton hosts a general meeting that is open to all members. This is an opportunity for you to hear about the work Cycle Hamilton is currently engaged in, and provide your input on current initiatives. It’s also a great opportunity to connect with like-minded people who ride bikes! These meetings are open to everyone — simply drop us a line if you are interested in attending! RSVP at info@cyclehamont.ca. Feel free to reach out with any questions or comments as well. Looking forward to seeing you there!